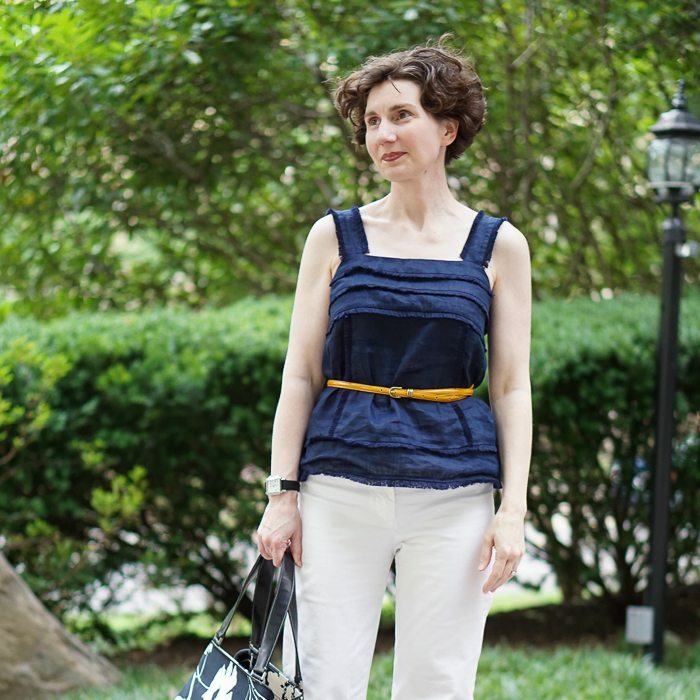 Looking back, it’s clear that navy blue has been a touchstone this summer. Why change now? In general, I don’t wear a lot of colors simultaneously. I often dress, head to toe, in one color. I usually am wearing two. Three is a stretch, and when I do it, two of the three are almost certainly related shades. But here, proving yet again that I cannot be put in a box, I am wearing four colors. Let’s count them off: white, navy, yellow, black. Four! 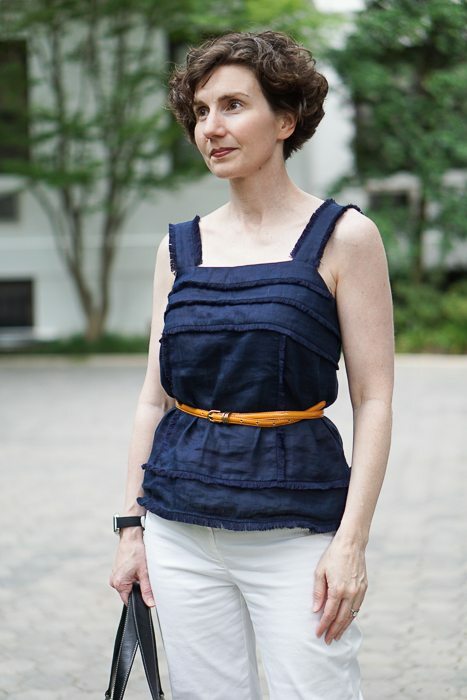 This top from JCrew is not sold or shown with a belt; it has a loose, floaty silhouette — which is highly appropriate for summer casual clothes. No criticism here. I added a belt to dress it up. The linen is soft enough to belt easily, but the cut is full enough to create a bell shape beneath the belt — very charming, I think. I could have worn this fringed linen top with a navy or black belt and it would have looked very smart. But I thought this marigold yellow would be an invigorating sliver of color. 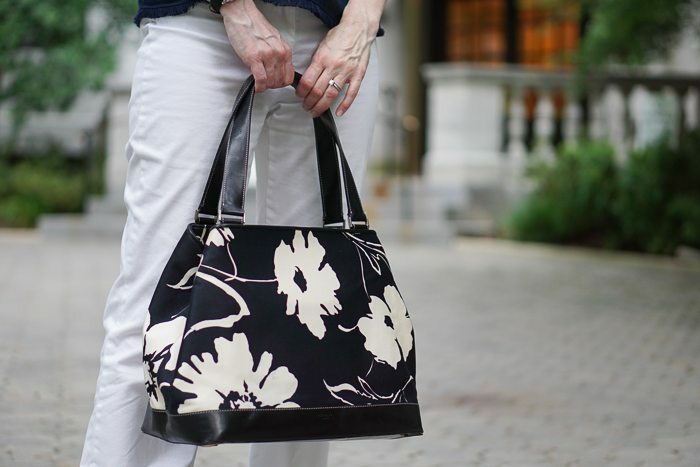 The graphic floral bag in black and white works well with the blue/black/white/yellow already in play. You might think (theoretically) that the pattern would be too busy, but the round floral provides the right contrast to the color-blocked outfit. Indeed, this whimsical bag is proof that a quirky item can be a stand-by. I use this bag all the time in the summer. I am a big fan of Orla Kiely, AV! Particularly her handbags. Sometimes her clothes veer into a look that is too girlish for me. But check out one of her boss like dresses in this post from last December: The Need for Sleeves. Love the marigold belt. Such a fun and versatile color. Perfect here. has the directrice ever waxed eloquent on the topic of Belts??? i find that i am much enamoured of her collection of cinching tools, and have started to notice the distinct lack of direction in my own belt options. a post giving more insight would be much appreciated. Unbelievably, I have held forth on this topic, Eric. See this earlier post: Little Pin, Little Scarf, Little Belt, in which I share my thoughts about assembling a prop box of belts, scarfs, and brooches to trick out any outfit. I hope it’s helpful! i should have known that the directrice would not have had such a ghastly oversight. thanks for the post link. i believe i am more of a wide belt person than a skinny belter. but the principle remains. and your thoughts on brooches and other finishing items are much appreciated. I liked the top in red in your last post and here it is in navy today! I bought a soft blazer in navy with white buttons this past weekend – all due to you and your very convincing ways. Navy looks sharp and “dressed-up” and I’m really digging it with the white pants too. I am an advocate by training . . .